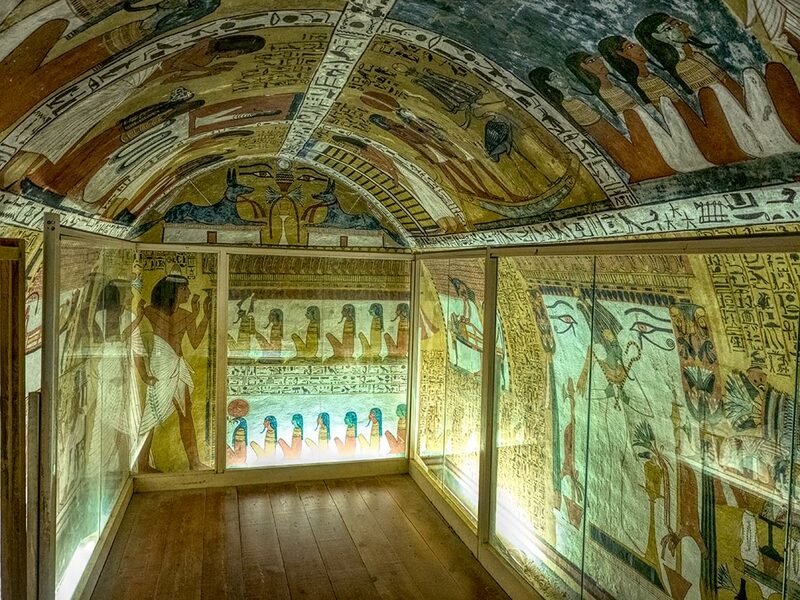 Interior of the Tomb of Sennedjem at Temple of the Artisans at Deir el Medina in Luxor, Egypt. Though every one of the tombs has a prominent sign saying “no photos,” in many cases an Egyptian guide would follow me inside and allow photos in return for baksheesh (a bribe). In most instances I declined, but this particular tomb was so beautiful that I did pay for the privilege of taking a photo. Of course, all my photos are taken without flash, so I was not guilty of degrading the artwork by doing so. The Tomb of Sennedjem belonged to an artisan who decorated tombs in the nearby Valley of the Kings and Valley of the Queens. Royalty required elaborate tomb illustrations that would provide everything they might need on their journey into the afterlife. Many of the tombs of the artisans, which were created by the sculptors and painters in their free hours, are just as beautiful as those created for the kings and queens. The architectural sites in Luxor were far and away my favorite, even more so than the Pyramids of Egypt. And among the Luxor sites, my favorite was the Great Hypostyle Hall at Karnak Temple. I so love your site, who you are, your heart view and vision of the world you photograph. I don\’t normally leave a message; however, in this moment, my own deep heart felt to acknowledge and appreciate you. Thank you so much what you bring to everyone in the innumerable ways that you do. May your life be blessed beyond measure in every moment. Oh my gosh, Maraine, you just made my day. I work so hard on my blog and make very little money on it, so comments like yours keep me going. You have no idea how much your comment meant to me. Many, many blessing back to you.